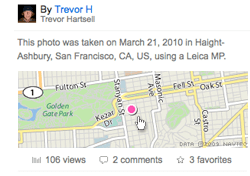 For over six years, you’ve made Flickr the place to be for photos. Billions of photos of the places you’ve been, the things you’ve seen, and the people in your lives. It’s an amazing photographic record that continues to amaze us. So as part of our Ongoing Quest to Make Flickr More WonderfulTM, we’d like to introduce… a new photo page! We’ve been keen to build a better showcase for your photos for some time. Your photos – everyday captures and extraordinary sightings, local scenes and exotic moments – are central to our DNA because they reflect your individual stories. With the new photo experience, you can discover, share and organize your visual stories in a new and improved way. 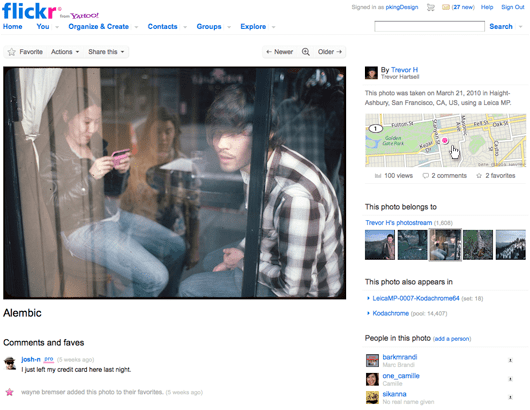 We will be rolling out the fresh features to the entire Flickr audience in the coming weeks, but why wait? The new photo experience is available for signed-in members to preview now. To opt-in, visit any photo page and follow the directions on top of the image. Here are some highlights to share the whats and whys of the new design. Your photos look fantastic when they’re big, so we’ve embiggened a lot of things. Photos will now be displayed with a larger 640 pixel wide size, and the photo page is a bit wider too. We think your monitors will approve. Photos represent a lot of information about the moment of capture – what, who, when, how and where. We’ve moved the photo title closer to the description to surface the ‘what’ better. The photo owner, dates taken, camera, and location of the photo are all within easy reach to the right of the image. The clustering of story elements has sparked many serendipitous discoveries around FlickrHQ – we hope you’ll find them a useful way to dig deeper into photos too. When you share your photos on Flickr, one of the more magical moments for your viewers comes when they explore all the rest of what you have on Flickr – your photostream, sets, groups, etc. So we’ve improved the navigation controls and performance on the photo page. 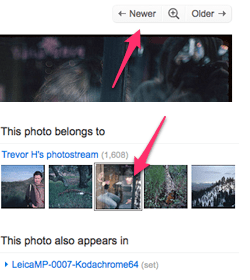 Getting from one photo to the next is fast, just a click away with the Newer / Older buttons above the photo. We’ve also rebuilt the film strip from the ground up to preview the photos surrounding the image that you’re viewing. The film strip is a great tool to dip into sets, groups, favorites and all the awesome rabbit holes that you can find on Flickr. Take a look. We think you’ll be tickled. We want visitors who see your photos to notice your photos, without distractions. 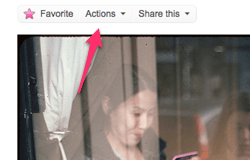 So we’ve reorganized all of the helpful features that you already know into a handy Actions menu. For those who prefer the dim and dark, we’ve built the brand new light box view to spotlight your photos. Click on any photo and voila! Browse in the comfort of your seats as you sift through crazy large images on a dark background. We hope you love getting immersed in this view as much as we do! The best sorts of stories inspire conversations around them, and we think photos have loads of inspiration. Favorites have long been a kind of commentary on the photo, so we’ve integrated favorites into the story. Anytime someone faves your photo, we’ll note the event in the comments and favorites section. These are just a few of the improvements we’ve made. There are many more nuggets to discover with the new photo experience, including improved owner settings and treatment for copyright designations. For more information, you can refer to these FAQs. The changes are a culmination of inspiration from your suggestions and feedback on designs we’ve tested over the years. So take a spin by opting-in and head over to the new photo page group to join a discussion. Photos from the TEDxOilSpill Expedition group, by duncandavidson, kk+, and PinarOzger. Photos from olvwu | 莫方 , sunshine莊信賢影像世界, PAPA GO!! !, nans0410 and Sunny Life.